Last summer the Writers Guild of America sent out ballots to all 9500 of its members. The scribes were asked to list their top 10 favorite scripts. The results are in and it is no surprise that Casablanca (1942) is the winner. 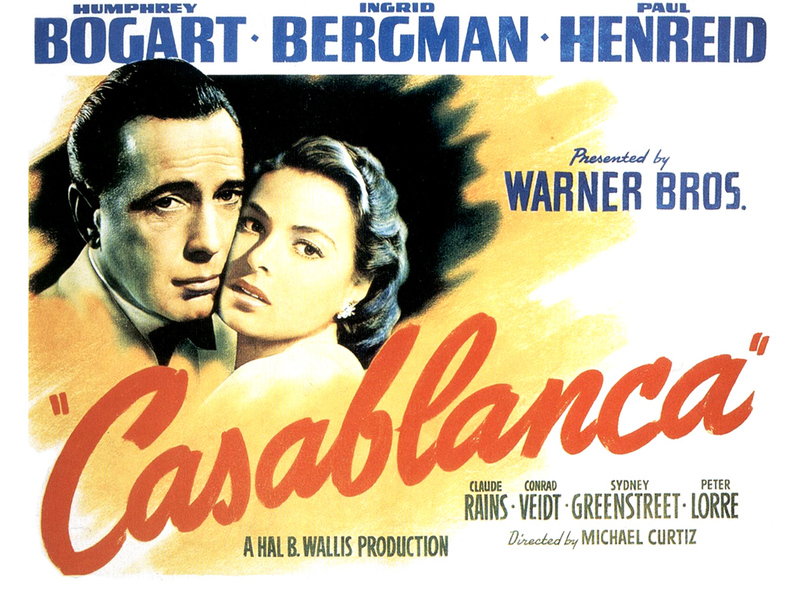 Classic World War II movie Casablanca has been voted the film with the best screenplay by top script writers in the United States. The 1942 film starred Humphrey Bogart and Ingrid Bergman and was written by Julius and Philip Epstein. The Godfather written by Mario Puzo and Francis Ford Coppola came second in the list from the Writers Guild of America Guild members voted for the top 101 film scripts from an original list of more than 1,400 nominated works. Third on the list came crime thriller Chinatown written by Robert Towne and starring Jack Nicholson and Faye Dunaway under the direction of Roman Polanski. Citizen Kane – another 1940s classic – by Herman Mankiewicz and Orson Welles was in fourth place followed in fourth by All About Eve by Joseph Mankiewicz. The other films in the top 10 were Annie Hall, by Woody Allen and Marshall Brickman, Sunset Boulevard by the writing team of Charles Brackett, Billy Wilder and DM Marshman Jr and Some Like It Hot by Wilder and IAL Diamond. Woody Allen, Francis Ford Coppola and Billy Wilder each have four screenplays on the list. Charlie Kaufman, William Goldman and John Huston earned three mentions each. Head over to the WGA website for the complete list and see if you agree with their 101 picks. Okay. That makes sense. And you know what, I agree. What about movies adapted from plays with excellent screenplays: A Streetcar Named Desire, Who’s Afraid of Virginia Woolf, The Lion in Winter, Suddenly Last Summer? Those are some great screenplays. But Casablanca does have a great script, too.